Voice Prompts are used to store recordings for auto attendants. This feature also has the ability to store files used for Music on Hold. 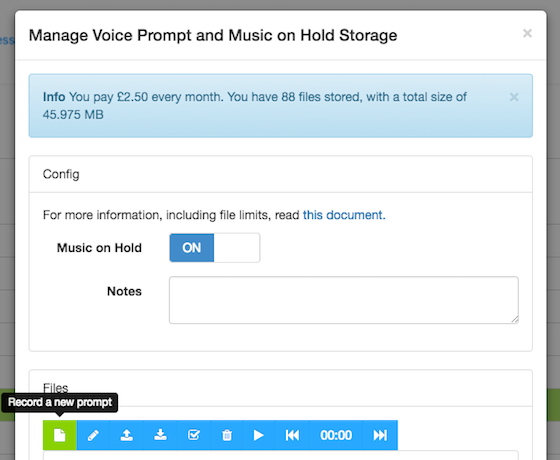 After adding the subscription, you can edit the subscription which will allow you to upload files into the Voice Prompt/Music on Hold storage space. When set to only Voice Prompts, then these files will be made available to rule chunks which allow them to be played as part auto attendants. When selected for music on hold, then all the files will be made available to music on hold chunks as well. You will also have the option to choose your default music on hold. Please note, we cannot play any music which is DRM protected as it will be only playable on the devices you have been authorised to play it on - which does not include our systems. This is enabled by ticking the Music on Hold checkbox within the subscription. It works the same as prompt space, you can simply add files to the space provided. Clicking on the file will toggle its status - whether it is on the default Music on Hold playlist. Please note, remove all metadata, album art, lyrics etc. Multiple language support is available. Default files should be stored in the format of filename.wav format. If you require a different language filename, this should be stored in the format of filename_en.wav - where en reprepresnts the country code of the language (this could be any string but 2 letter ancronyms are very readable). When a call comes in for 9 then play ourintro.wav wait for the user to dial 1,2,3.. and go to extensions playfile,changelang respectively. ourfile is something like: ‘dial 1 for english or neu 2 ar gyfer Cymraeg’ (the second bit is 2 for Welsh). When 2 is selected the rule jumps to changelang: When a call comes in for changelang then set the country code to wales then jump to extension playfile. Both routes eventually end up at playfile: When a call comes in for playfile then then play the recording completed.wav then hangup the call with the reason normal clearing. When you support multiple languages you must ensure you supply files for both the base filename and the language filename. In this example complete.wav and completed_wales.wav. Up to 10 Music on Hold files can be marked as default, each call will pick 1 default file, at random, to play as Music on Hold. Note, as per our terms and conditions, you are responsible for the content you store for your use within your phone system. This includes ensuring you have the relevant legal rights to play the content to a public audience via our system. To obtain a license to play music which is coptyrighted can be done through both PPL and PRS. PPL collects and distributes money on behalf of record companies and performers. PRS for Music collects and distributes money on behalf of songwriters, composers and publishers. The music babblevoice plays by default is not copyright restricted in anyway and has been contributed to the public domain, so no license is required on your part to play this. Select Voice Prompts from the list so it is highlighted green and select edit at the top of the screen. Before you start recording you will have to name it i.e. OpenOffice.mp3. (Please be aware it will need to end in .mp3 or .wav) Please make sure the phone you would like to use for the recording is selected under ‘Device’. WARNING: Once you hit record the selected phone will ring. When you pick up the handset start recording and to finish recording simply hang up the handset. Please see screenshot below. 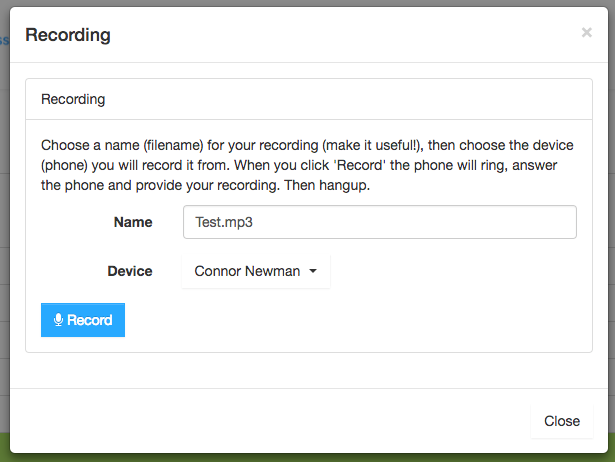 Once you finished recording your new prompt will appear in your file list on the ‘Voice Prompt’ Section. Now to input it into your rules! Find the rule which you would like to change, select it so it is highlighted green then click ‘Edit’ at the top of screen. Finally hit save and close. Your rule should be set up now! Simply place a test call to listen to it.